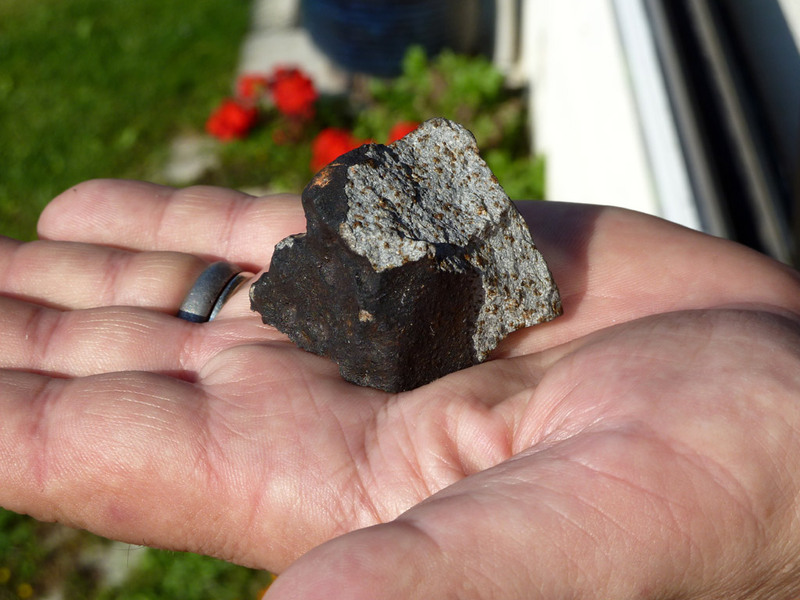 Essonne : une meteorite tombe chez... Mme Comette ! Apologies, to anyone who reads French, for the absence of accented-characters in the above. Last edited by David Entwistle on Tue Feb 28, 2012 8:36 pm, edited 2 times in total. Just saw this on the metlist, looks like a confirmed new fall. Doesnt appear the lucky Homeowner is selling it though so probably wont be any appearing on the collector market anytime soon. There's an excellent close up photograph of this fall on the web site of Alain Carion. When I was down at the Met Soc meeting in Greenwich I got talking to Dr Jambon about various things...including the controversial AL HAGGOUNIA 001 ("NOT" AUBRITE), and he told me there had been 3....yes three!....falls in France this year that he knew of and I think this is one, as he did mentioned Paris and a house hitter, but would not give any details. Strange that they have been kept so quiet up till now, especially as Monsieur Carion was involved and he has worked closely with Anne Black and the IMCA. 3 French falls!? Hhhmmnnnhh, very surprised that stories of these have not filtered through. Like you say as no doubt Alain Carion had some invlovement in them somewhere along the line. Dont think we could keep it a secret if we had one in the UK! Another photograph and a video here. They are obviously good at keeping things quiet though as this shows that the initial find/finds/fall were at the beginning of July.....and Albert Jambon was involved in the recovery....so I'm inclined to believe what Albert told me....just reported through the met list. Lots of news reports about showing Alain Carion and his shop etc. Barwellian wrote: They are obviously good at keeping things quiet though as this shows that the initial find/finds/fall were at the beginning of July.....and Albert Jambon was involved in the recovery....so I'm inclined to believe what Albert told me....just reported through the met list. France is the country that receives the most meteorites per capita in the world. Well, thats another meteorite that fell on my birthday which I'm not going to be able to get a piece of! I should wait till it's confirmed to be that date and then contact Alain Carion....It's my bet he has negotiated for some of the fragments. Not sure if his contact address, but you could almost definitely get that from Anne Black.